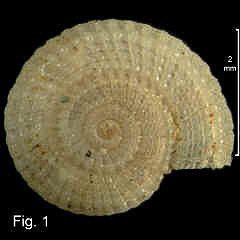 Description: Shell small, spire very low and flat. 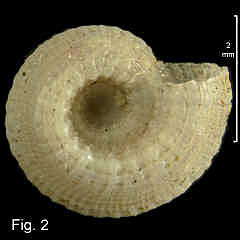 Teleoconch whorls sculptured with a deep, wide groove at suture with 4 spiral cords below which cross axial ribs of about same strength, forming beads at intersections. Uppermost spiral moderate in strength, 2nd and 3rd weaker, lowermost stronger;. lowermost spiral constitutes upper peripheral cord on last whorl. Periphery with another similar cord at bottom, and 1 or 2 very fine spirals between upper and lower peripheral cords. Base convex with about 6 beaded spiral cords between lower peripheral cord and umbilicus. Umbilicus widely open, margin strongly toothed. Colour white, sometimes translucent. 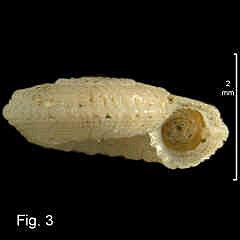 Size: Up to 5.3 mm in diameter. Distribution: Indo-West Pacific. In Australia, from Gulf St. Vincents, SA, clockwise around Australia to Sydney, NSW. No specimens known from Sydney southwards to Gulf St. Vincents, SA. The Australian Museum collection extends the range of this species from that given by Bieler (1993) with specimens from Sri Lanka, Papua New Guinea, Indonesia, New Caledonia and Fiji. Habitat: In the Australian Museum collection most specimens are empty shells from beach washup, with a few subtidal down to 115 m. A few have been collected alive intertidally, including the specimen figured here in Figs. 1–3. Bieler (1993) gave the habitat as down to the upper bathyal zone at 685 m.
Synonymy: Torinia foveolata Tate, 1893 is a previously recognised synonym with types from Aldinga Bay and Semaphore, Adelaide, South Australia. Remarks: Pseudotorinia laseronorum (Iredale, 1936) was recognised by Bieler (1993) as a separate species, being differentiated from the current species by not having additional cords between the upper and lower peripheral cords. This character is clear in the holotype of P. laseronorum, but there are many specimens of P. delectabilis in which the intermediate cords are very weak, suggesting that P. laseronorum may be an extreme form of P. delectabilis. The shells figured by Garrard (1977, pl. 5, figs. 1-3) as P. delectabilis are incorrectly identified (Beiler,1993). Figs. 1–3: Minnie Waters, NSW, in rock pool, on seaweed under rock (C.070014).